In this review we’ll look at one of the latest offerings from Nest: the Alexander Mattress. Note that this review will discuss the all-foam version of that mattress, if you’re looking for the Alexander Hybrid with coils, you can check out our review of that in the appropriate section. Nest has been in the mattress and bedding business for a while now, and the company focuses on making a mattress that isn’t only comfortable and nice to look at, but also focuses on making sure their mattresses are made in an ecological responsible way. They are noted for using organic, natural, and non-toxic materials in their construction, and for making sure that their materials are sourced in a sustainable way. Read on and see if this is the mattress for you. Should I Buy the Nest Alexander Mattress? The Alexander is a four layer foam mattress. The combination of different layers made from different thickness of different materials is designed to provide all of the desirable qualities of memory foam while minimizing the drawbacks that are sometimes associated with that material. The four layers have a total thickness of 13”, which is more than most of the other all foam mattresses on the market. Top – the uppermost layer of the Alexander is designed for cooling and comfort. It is made from 4” of gel infused memory foam. The gel infusion works to remove heat by aerating the mattress and transferring heat out of the bottom and sides of the mattress after moving it away from the body. This layer also offers a good amount of support and relief from pressure points. Second – the second layer of the Nest Alexander is made from 1” of Visco foam. It is designed to provide bounce, cooling, responsiveness, and comfort. It adds extra support to the uppermost layer and works to help the mattress retain its shape and prevent the sinking feeling that some people get from memory foam mattresses by enhancing the responsiveness of the material. Third – the third layer is a transitional layer that is comprised of 2” of transition foam. The transition foam offers support to the upper layers while creating an area with a density in between that of the second layer and the bottom, foundational layer. This level of support helps with deep compression and makes it a good option for heavier sleepers. Bottom – the foundational layer is made from 4” of base foam. This layer is the foundation of the mattress, and helps with edge support while preventing the mattress from bottoming out or sagging in the middle, enhancing its durability. As you can see, the overall thickness of this mattress is a bit higher than many other foam mattresses we’ve reviewed. Moreover, the different layers are all designed with providing the best sleep to as many sleepers as possible. The increasing foam density as you move from top to bottom allows the mattress to offer good support without being overly firm. 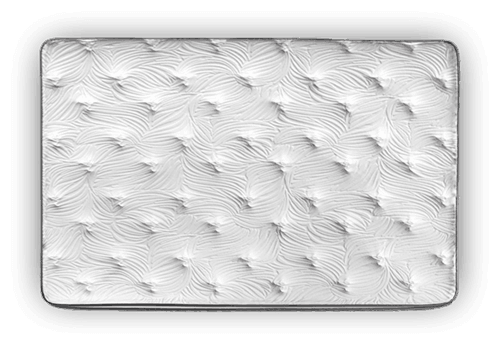 The cover of the Alexander is very much like most of the covers on other foam mattresses being produced these days. It consists of a white top and gray side panels. Unlike other mattresses, the top and sides are textured and quilted, which adds a nice aesthetic touch. The texturing looks more intense than it feels, so sleepers won’t have to worry about strange shapes under them while they sleep as a result of the stitching. The Nest Alexander actually comes in three different levels of firmness, soft, medium, and firm. This review focuses on the medium version of the mattress. In terms of firmness, on a scale from 1-10, with 1 being least firm and 10 being the most firm, the soft version is a 3.5, the medium option is a 5.5, and the firm option is an 8.5. Therefore, the Alexander covers a wide range of firmness, making it an attractive option for those who prefer neutral firmness as well as those whose preferences lay at the extreme ends of the firmness spectrum. The quilted cover on the mattress provides a very soft feel at first, but you quickly feel the support of the underlying layers pick up as you sink into the mattress a bit. This creates a balanced feel that many other mattresses struggle to replicate. The foam combination in this mattress provides a slight amount of hug and contour, but avoids excessive hug. A lot of people prefer this, as too much contour and hug can create a sinking sensation that has been described as resembling quicksand. The hug provided is sufficient to create great pressure relief though, which is a credit to Nest and this mattress. In terms of coolness, the Nest Alexander performed very well. The quilted cover does a great job of facilitating airflow and breathability, as does the uppermost layer of gel-infused memory foam. Moreover, the lack of intense hug also increases the airflow potential, further helping to cool the mattress. The motion transfer and control properties of this mattress are also very well done. The Alexander does a good job of isolating motion to a localized area and means that you won’t disturb or be disturbed by your partner moving in their sleep. The support provided by the Alexander is also very good. The previous Nest mattresses were a bit lacking in this regard, and it’s nice that they didn’t overcompensate and produce a mattress that’s so firm it creates pressure points. As with all of the mattresses we review, we put the Nest Alexander through a series of sinkage tests. Sinkage tests are a great way to get a feel for the durability and the support that the mattress will provide. Our tests are conducted by an individual weighing ~140lbs, so your results might be different depending on how much you weigh. Laying on Back – laying on the back in a standard sleeping position with weight evenly distributed created 1.5” of sinkage. Laying on Side – laying on the side in a standard sleeping position with weight evenly distributed resulted in 2” of sinkage. Slight Edge Sit – sitting on the edge of the bed but without putting the full body weight on the mattress caused 3.5” of sinkage. Full Edge Sit – sitting fully on the edge so that the mattress is supporting the whole body weight resulted in 4.5” of sinkage. This is a bit better than some of the other foam mattresses we’ve looked at. As you can see, these numbers are in line with or better than many of the other foam mattresses on offer these days. These numbers also demonstrate the Alexander’s ability to control motion transfer, as minimal sinkage means that the mattress isn’t shifting or moving around much. The Nest Alexander costs a bit more than other foam mattresses purchased from online retailers. Some of this cost is the quilting and texture on the cover, and the rest is the result of the different types of foam and greater overall thickness. As a result it’s not necessarily the best value, but it does produce a great night’s sleep and could be worth it to many people. Shipping – Shipping is free. The mattress will show up at your door compressed in a box in less than 7 business days. Warranty – Nest offers a 20 year warranty on the Alexander mattress, which is twice as much as most other foam mattresses provide. This speaks well to Nest’s confidence in the product. Trial – Nest will give you 101 nights to make sure the Alexander is the right mattress for you. Returns/Refunds – You can get a full refund as long as you ask for it during the 101 night trial period. There are many people who will enjoy the Nest Alexander mattress. It’s one of only a few companies that offers their mattress in three different levels of firmness, so it can appeal to a wide range of sleepers. Additionally, the quilted cover and uppermost layer of the mattress provide excellent pressure relief, making it appealing to people who have neck or back issues or problems with spinal alignment while sleeping. Moreover, individuals with a sensitive sense of smell will enjoy the Alexander. It doesn’t have any “off-gassing” period, which many foam mattresses will have. This is the result of the unique manufacturing process that Nest uses, as well as the avoidance of chemicals and the use of natural and organic materials whenever possible. Finally, the Nest Alexander is a good choice for sleepers who are looking for a balanced mattress. The Nest has good bounce, responsiveness, hug, contour, cooling, breathability, and support. However, it doesn’t go overboard on any of these elements, which helps make it appealing to a broad range of sleepers. On the whole, the Nest Alexander is a good mattress for many people. It’s a bit more expensive than some of the other foam mattresses we’ve looked at, but it also has better performance in a number of areas, including hug, contour, edge support, and pressure relief. As a result, it might be worth spending a bit more in order to get the benefits that the Alexander can offer. After all, a mattress is a major purchase and is something that you’ll use almost every day, so why not make sure that you’re getting the best mattress possible, especially considering the 20 year warranty that Nest offers.